Goodman Jewish Family Services of Broward County will host its 12th annual Breaking the Silence Luncheon at 10 a.m. on Jan. 27 at Signature Grand, 6900 State Road 84 in Davie. 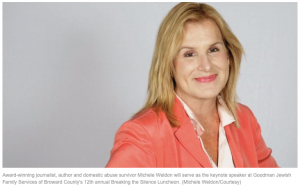 During the luncheon, which will benefit the Goodman JFS Domestic Abuse Program, award-winning journalist, author and domestic abuse survivor Michele Weldon will serve as the keynote speaker, while Judge Geoffrey D. Cohen, a Domestic Violence Division judge of the 17th Judicial Circuit in Florida, will receive the 2019 Ending Abuse Award. Weldon will share the experience she endured with domestic violence while she was in a nine-year marriage to a man many considered to be the perfect husband. Tickets cost $150 person and include lunch and one raffle ticket. Verizon will be the luncheon’s presenting sponsor. Visit jfsbroward.org to purchase tickets for the luncheon, or contact Jennifer Cohen, the agency’s corporate development officer, at 954-909-0797 or jcohen@jfsbroward.org for more information, including sponsorships. Call 954-370-2140 for more information on the Domestic Abuse Program.